And welcome to the Saint Patrick Day’s edition of Guitar Noise News, the “official newsletter” of the Guitar Noise website. If you prefer, you can just think of it as the “March 2014” edition. 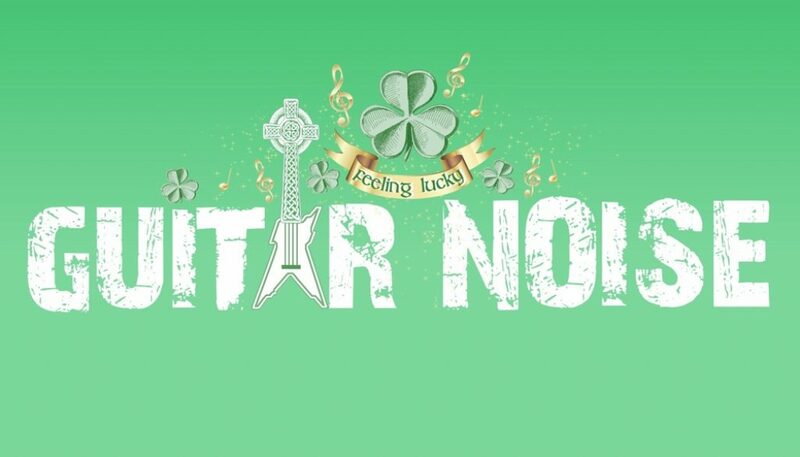 And it seems that Paul has commissioned an appropriate Saint Patrick’s Day version of the Guitar Noise logo, which you can see at the upper left hand corner of any page on the website. Feel free to display it with pride, right along with the great logos we had for both Chinese New Year and Valentine’s Day. As mentioned last time, we’re hoping to have new variations of the Guitar Noise banner up for special occasions throughout the entire year. So if you’ve any suggestions as to the “when,” just drop a note in the Comment Section of this newsletter. Especially if you’re feeling lucky today. I have found your lessons “A Guide To Reading Musical Notation” very helpful. Could you help me interpret the significance for guitar playing of the notation in the image below (from a transcription for guitar of a Bach Fugue). 1. Most generally, why are notes linked together with an ‘upper or lower bar’? – sometimes 2, 3, or 4 notes are connected. Why is the first note in this example not connected to next 3 that are connected with an ‘upper bar’? Does this ‘linking’ have any effect on how the notes are played? Is that linking notation of the notes (‘bar’) called a ‘beam’? 2. In the image the two sets of lowest notes are connected, why? Again, does this ‘linking’ have a have any effect on how the notes are played? 3. Finally, how do “play” the combination of the ‘upper bar’ and the ‘lower bar’? Thanks for any help you have time to give me and I hope this question is not too much out in left field. Hello and thank you for writing. I’ll try to answer your question as best I can. Typically in guitar music, notes given downturned stems (these are the notes connected by the lower bar) are bass notes and the downturned stem is an indication that these notes should be picked with the thumb while the notes with the upturned stems (the notes with the upper bar) are picked with the fingers. And, again, depending on the computer software one uses to create written music, the software will group eighth and sixteenth notes together beat by beat. 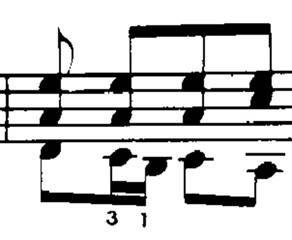 That’s why the first low three notes are joined by a lower bar. The first note (D) is an eighth note (half-a-beat) while the following middle C and B are sixteenth notes (which are a quarter-beat each so the two of them add up to a half-beat). I have no idea at all why the writer didn’t do the same for the higher notes,. either grouping them in pairs or linking all four together. Beat 1: Pick the open D with the thumb while simultaneously playing the open high E string and the A note at the second fret of the G string (fretted with the middle finger). Use your ring finger or middle finger to pick the high E string and your index finger to pick the G string. Beat 1.5: Pick the C note (fretted with the ring finger at the third fret of the A string) with the thumb while simultaneously playing the open high E string and the A note at the second fret of the G string (fretted with the middle finger). Use your ring finger or middle finger to pick the high E string and your index finger to pick the G string. Then use your index finger to fret the B note at the second fret of the A string and pick that note with your thumb. Beat 2: Pick the C note again (fretted with the ring finger at the third fret of the A string) with the thumb while simultaneously playing the open high E string and the A note at the second fret of the G string (fretted with the middle finger). Use your ring finger or middle finger to pick the high E string and your index finger to pick the G string. Beat 2.5: Pick the open A with the thumb while simultaneously playing the open high E string and the C note at the first fret of the B string (fretted with the index finger). Use your ring finger or middle finger to pick the high E string and either your middle or your index finger to pick the B string. I hope this helps. Your question certainly isn’t “out in left field” at all. Please feel free to email me with other questions you may have, particularly if I didn’t explain this one well enough. Power chords have long been a huge part of any guitar player’s techniques. This tutorial will explain just what power chords are as well as the many different ways you can go about playing them. Here is a relatively simple yet still somewhat challenging single-guitar arrangement of Van Morrison’s “Crazy Love,” which was included in the artist’s 1970 smash album, Moondance. As always, we’ll walk you through it step by step and the lesson comes complete with both music notation, guitar tablature, and MP3 audio files. While most people take up the guitar to play songs, there can be quite a bit of difference when it comes to defining what “playing a song” actually means. Fortunately there’s not a single right answer and, also fortunately, we here at Guitar Noise can help you play your songs in many different ways. Don’t forget that Guitar Noise invites you to advertise you (or your band’s) upcoming gigs here on our Events Page. Announce your gig, drop Paul a line on our “Gig Alert” thread on the Guitar Noise Forum page’s News Section. Finally, coming up soon in our Guitar Noise Song Lessons section you’ll find lessons on Radiohead’s “Fake Plastic Trees” and “Karma Police.” We’re looking to add future lessons throughout 2014, featuring songs from Led Zeppelin, Gordon Lightfoot, R.E.M., Sheryl Crow, and the Grateful Dead. I’d like to take a moment this time out to congratulate Guitar Noise Forums’ “Moderator In Chief” Nick Torres on his recently completed run as Arthur Przybyszewski (try spelling that from memory!) 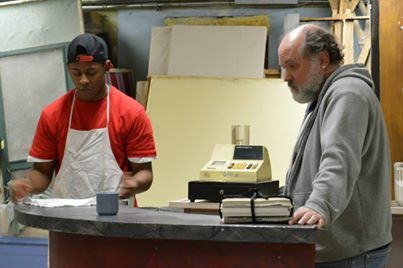 in the Silver Springs Stage presentation of Tracy Letts’ play “Superior Donuts.” You should check out the great reviews the production received. This sort of thing, along with the note about Alan Green’s Valentine’s Day gig in last month’s newsletter, naturally make me marvel at all of the talented and giving people we have as part of the Guitar Noise community. It’s an honor to be a part of it. As always, I look forward to bringing you more news about both the Guitar Noise website and its members. Play often (meaning “every chance you get!”).